Have you or someone you know been contacted or detained by the Federal Immigrant and Customs Enforcement (ICE)? Is someone you know facing deportation proceedings? If so, keep in mind Stand Together Contra Costa, an Immigration Legal Services and Rapid Response Network Promoting Safety and Justice in Contra Costa County. The mission of Stand Together Contra Costa is to ensure that all people in Contra Costa County, regardless of immigration status or ability to pay, are afforded the rights established by the United States Constitution and are protected from actions or policies that result in disparate, discriminatory, or unlawful treatment. Call 925-900-5151 if you ever see ICE activity, if you or someone you know has been detained or arrested by ICE, or if you or someone you know is facing deportation proceedings. Go to www.standtogethercontracosta.org. JANUARY 23 MEETING PREVIEW – OUR ELECTIONS! Our current president, Peter Chau, has agreed to continue as Interim President until we are able to recruit someone else to run. We are still trying to recruit someone to agree to be Vice President of Publications. We will have a proposed budget for your consideration by Friday; however, we wanted to give notice that the budget will be voted on at our January 23 meeting. February 27 at Harding School Auditorium – Candidate forum with the 9 candidates running to fill the 15th Assembly District seat currently held by Tony Thurmond. Assemblymember Thurmond is running for State Superintendent of Schools. July 4 — Club participation in celebration at Cerrito Vista Park. August – A Saturday meeting at El Cerrito High School for local races (City Council, School Board, regional parks, etc.) Date to be announced. We will be able to propose program topics for the regular meetings in April, May, June, July and September. For the past few years, the leadership of the CDC has been in disarray, and its activities have been erratic. However, there is a new effort to re-vitalize it, and as an affiliated club, we can participate in the election of new officers to the CDC. That election will take place in San Diego during the California Democratic Party Convention on February 23, 2018. Since we have 198 members we are entitled to 20 delegates. Delegates must be present to vote. We can elect our delegates at our January meeting. Delegates will have to attend the CDP convention in order to participate. Travel and accommodations will be the responsibility of the individual delegates unless our members vote to subsidize these expenses as part of ratifying our club budget. Several members of our club are also delegates to the CDP Convention, so attending the CDC meeting would not entail additional expense should any of them decide to volunteer to run as CDC delegates. Voting delegates must supply their email address to the CDC in order to receive election related communications. RECAP OF THE 2017 DINNER! The 65th Annual El Cerrito Democratic Club Annual Dinner was a resounding success! Our keynote speaker was the inspirational Delaine Eastin, former Superintendent of Public Instruction. 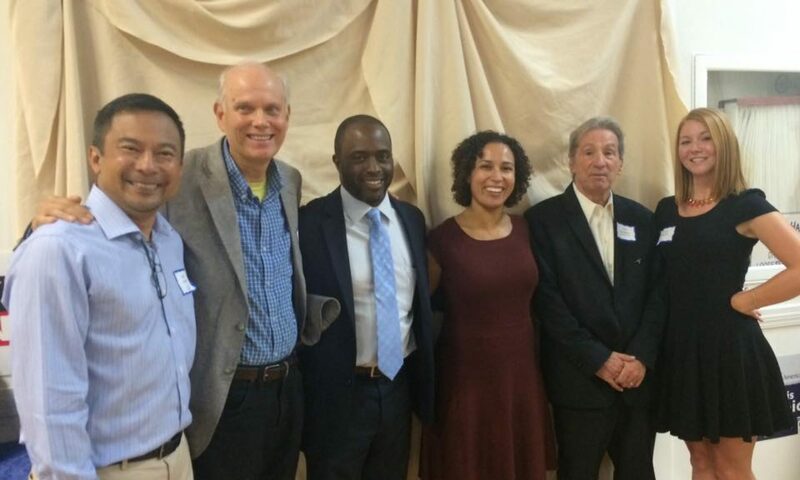 There were over 100 attendees, including six of the candidates running to succeed Tony Thurmond as our Assembly member for AD 15, all 5 El Cerrito City Council members, our County Supervisor John Gioia, and Maria Alegria, Chair of the Contra Costa County Central Committee. There were several other elected officials – our own Stege Sanitary members Al Miller and Dwight Merrill, Dana Dean from the Solano County Board of Education, and luminaries from several boards and commissions. We also honored members who had been involved with the club for over 39 years: Dwight and Gloria Merrill, Betty Brown, Grace MacNeil, and Art and Sue Walenta. We’ll take this opportunity to thank Dwight and Gloria for the pyracantha center pieces, Art and Sue for the wine, juice, popcorn and pretzels, and Grace for her excellent work in the kitchen. Grace and Marty Seuss have kept the buffet organized and attractive for several years. Not only are all the sides, salads and desserts provided by members organized an presented, the buffet itself kept tidy and attractive, but at the end of the evening the kitchen is clean and sparkling, and members can retrieve their serving dishes and utensils. But I think we’d all agree that our keynote speaker, Delaine Eastin, provided many many highlights to our evening. She claims to have a “spine of brass” which she amply demonstrated with her forthright support for transit oriented housing, against fracking, and healthcare for all. Her unequivocal support for public schools, backed up by a demand for a moratorium on charter schools, a detailed analysis of the harm caused by “sending our education money to for-profit corporations out of state” earned her cheers and a standing ovation. Her well-known statement that “budgets are statements of values” was illustrated as she dissected the spending patterns that built 4 times as many prisons as state colleges over the past 40 years, and identified how reforming Proposition 13 would provide the funds urgently needed to make California an education powerhouse. She described the breadth of careers and job opportunities that California’s adult learners could aspire to if the educational resources were available, and described how our state could have centers of productivity in many areas that would provide the kind of economic stimulus and incentive that we now get from Silicon Valley. While some of us were concerned that her background as our State Superintendent of Public Instruction might be a limitation, when she quoted Neil Postman who said, “children are the living messages we send to a time we’ll never see,” many of us had tears in our eyes. That image showed us all that her commitment is not just to education, not just to our students, but to us, our present and our future. We will note here that the Club’s new dinner caterer, Larb, did an excellent job supplying chicken curry, coconut fried rice, and the exceptional vegetarian stir-fry with tofu. Their setup kept the food hot to the end of dinner hour. There are many great photos, but for a good collection by Rita Xavier, please check out her Facebook page at https://www.facebook.com/ritax1.